In 1986, British jazz drummer Bill Bruford launched his first Earthworks, a jazz quartet featuring some of England’s best young jazz musicans; pianist/trumpeter Django Bates, saxophonist Ian Ballamy, bassist Mick Hutton and later, bassist Tim Harries. At that time, Bruford had introduced electronic drums into the fray, most notably England’s popular hexagonal Simmons pads. Bruford’s ability to play samples, chords, and melodies from the drums, was a musical first, however, after much acclaim and success, the tempermental nature of the Simmons drums and the growing demand for his now famous young trio, ultimately gave way to new members and an all acoustic drum kit. Now, 20 years later, Bruford and his latest incarnation of Earthworks celebrates its 20th anniversary with the “Earthworks Underground Orchestra”. Bruford and co-leader, saxophonist Tim Garland took fresh arrangements of some of the band’s best loved tunes over to NYC, to work with some of the finest players in the U.S. in a nine-piece configuration. This CD sounds like the perfect anniversary party, and oozes that feeling of fun and excitement as the celebrations got under way. It is indeed a rare opportunity to find Bruford in such a unique setting. “The last time I did anything on this scale was with the Buddy Rich Orchestra, which I loved” he says. “I like to think I did at least as well with them as Buddy would have done with King Crimson! It’s a privilege for me to have the Earthworks’ book given the Garland treatment. I wasn’t sure I knew entirely what it would sound like with the American guys, but for certain I had the best seat in the house when I finally found out”. The CD includes Earthworks standards such as “Up North” and “Libreville”, newer material such as “Bajo del Sol” and “Speaking in Wooden Tongues”, and the beautiful ballads “It Needn’t End In Tears” and “Rosa Ballerina”. Several of the band members –trumpeter Alex Sipiagin, alto player Steve Wilson, and of course, saxophonist Garland– are distinguished jazz leaders in their own right. Earthworks Underground Orchestra comes with a bonus 2 track CD for the first 3000 individually numbered copies. For those familiar with Bill Bruford’s Earthworks, this is a hugely entertaining way of re-visiting the band’s best loved tunes; for those unfamiliar with the band, or the sound of a large group of the USA’s top players in action. 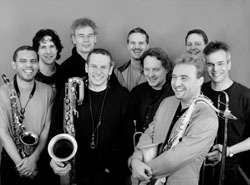 In a preview of the CD, “All About Jazz” reviewer John Kelman wrote, “Earthworks Underground Orchestra began as a marriage of Garland’s London-based nine-piece Dean Street Underground Orchestra and the Earthworks repertoire after Garland joined the group in 2003. For the December, 2004 Iridium date, Bruford and Garland recruited New York players like saxophonist Steve Wilson, trumpeter Alex Sipiagin and pianist Henry Hey. With Garland’s not insignificant skills as an arranger, the material—a cross-section of Earthworks material old and new—is infused with new life and greater depth. Garland’s sleight of hand makes the orchestra feel even larger than it is. “Libreville,” from 1980s Earthworks, is reinvented as a kind of odd-metered calypso, with flutes, muted trumpets and trombone morphing the original melody into rich counterpoint. Another 1980s tune, “Up North,” deconstructs the simple I-IV-V theme, Garland passing it around from horn to horn. Rather than reproducing the strong backbeat of the original recording’s solo section, Bruford plays it lighter and introduces an Afro-Cuban vibe, with Wilson and trombonist Rock Ciccarone delivering the kind of strong solos that define the entire set, leading into a kind of structured free-for-all at the song’s end. Garland’s more complex and stylistically varied writing will be no surprise to those familiar with If the Sea Replied (Sirocco, 2005). Despite the episodic nature of “Speaking in Wooden Tongues,” it never lacks focus; Bruford’s open-minded interplay is a highlight during Wilson’s modal solo. Bruford’s evolution as a writer is also clear. Garland’s tour-de-force arrangement of Bruford’s “The Wooden Man Sings, and the Stone Woman Dances” hints at greater freedom, deeper harmonic understanding, and Bruford at his most swinging. Kelman’s observations are dead on, as usual. One thing omitted in these observations, is that since “September 11th”, European and American musicians ability to tour have been severely hampered. Time consuming visa applications and costs, have affected not only jazz musicians, but the world of rock and even opera. The fantastic recordings of these European musicians, may be the only opportunity many of us get to hear them, short of traveling abroad. I may have to take that a trip to Europe this summer!